I wanted to drink a kombucha. Don’t make fun. That’s how it started. This morning before work, I went to the grocery store to buy a kombucha. There was an employee in line in front of me, buying his employee-discounted water. While he paid, he chatted it up with the girl cashier, who looked 16 but was probably closer to 22. Clearly, they were friends. When it was my turn to ring up my drink, the guy hung around. The girl passed my kombucha through the scanner. Then, instead of saying anything, she looked up at me for the first time, and rested her chin on her hand. The register read $3.49 in black numbers. She looked up at me with a half smile on her face. I swiped my credit card and waited. The girl continued to gaze up at me, wordlessly. I looked down at the credit card machine. It said “Wait for cashier authorization.” So I waited. The girl stayed frozen, smiling, resting her chin. Finally, the guy who’d just bought his water punched her in the arm. The guy took the girl’s arm and shook her out of her reverie. Finally, the girl spoke up. “Do you have a daughter?” she asked me. “Nooo…” I said, still politely waiting for her to authorize my credit card. I needed a kombucha to process what was happening. I left the store. Huh? What was that? I got in the car, finally realizing what’d just happened. Did I just get asked whether a girl in her 20’s was my DAUGHTER? My thoughts spun around. Which is to say they were mostly: Ohmigod. Do I really look like I’m 44? Is this just an awkward conversational attempt? Stop flattering yourself. I probably just look like I’m 44. Yep, I look 44. It might be all that suntanning. It ruins your skin, you know. Wow, that’s never happened to me before. I’m only 32! In the car, I think it over and reason with myself. I’m a firm believer that ageism is a horrible, internalized demon of women in particular. As a little girl, I never understood why age was such a big deal to women. Now that I’m grown, I feel the weight of society’s values on youth and beauty. I feel this in ads, treatment I get, the beauty aisle at Walgreen’s. In the car, I kept reasoning with myself: I want to be honest and proud about my age. And I want to take any reference to age as a compliment…whether it’s being seen as 20, 30, or 60. I told myself: It is a form of self-love. When I’m 44, my 44-year old self will be glad that younger women do NOT find it offensive to be seen as I am. So — I write it into truth — if I appear older than the 32 years I’ve lived, so be it. My 20’s were great, and I’m so glad I’m 32, with the mind, spirit, and body I have now. What’s the best thing about not being in my 20’s? On this path of self-acceptance, I love myself better with each day. And I’m 10 years further on this journey than I once was. And today was a first real lesson in un-internalizing my ageism. In letting go of any need I might have to unrealistically preserve a younger version of myself forever. So thank you, girl at the grocery store, for asking me whether your co-worker was my daughter. I hope she reminded you of me not only because of our skin and hair color… but because we both have spirits, we both love life, and we both honor our bodies regardless of what others may think. Let’s drink to that! 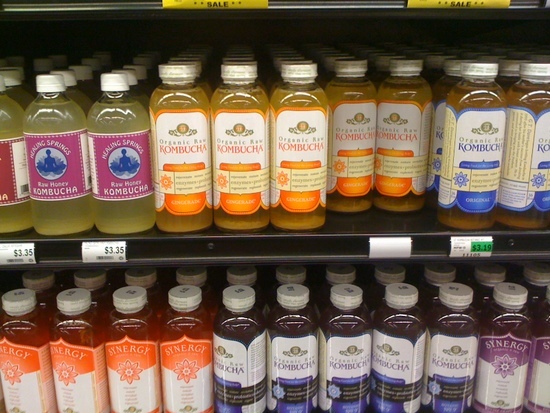 A kombucha to honoring age in all its forms. And, I’ll see you when I come back tomorrow for another glass. I believe that if there is one final description of the simplest, yet most essential single goal of living as a human being it is this: To be old. That is the only way to see, hear, smell, touch, taste, and feel as much as you can of this life. Congratulations on letting go of any need to unrealistically preserve a younger version of yourself – that is the way to disappointment and regret, not experience and joy. Most people never get that. Many come to it very late. It has taken me 437 years to reach the conclusion that you have in only 32?? Amazing – Kudos to you, Elisa… kudos to you.